It’s only a matter of time before Hallmark starts selling cards for it, but it looks like Awards Show Season is the newest American holiday. And social media is to blame. The confluence of fans, brands and the shows themselves have taken what were once minor spectacles and turned them into major celebrations. That’s been a boon for the events themselves as well as the brands smart enough to be associated with them. And what started out as a handful of fans using Twitter to make snarky comments about Super Bowl commercials has turned into an eight week-long celebration of celebrity that takes place not just on Twitter, but on Facebook, Instagram, Vine, Pinterest and, more and more, Snapchat. One positive result of all this inflation is that brands, shows and frequent social media users now realize they need to bring their creative A games, that social media is built on buzz and that the only way to get that buzz is to create something people want to talk about. Which is rarely (if ever) a canned marketing message. That’s lead to some BRaVe executions this year, the most notable (in our humble opinion) being the four minute Imagine Dragons concert that Target pulled together for the Grammys, the first real example of branded content being used as a commercial. The spot was perfectly Targeted (pun intended) at the music-loving Grammys audience and by giving them something they wanted to see rather than more “me! me! me!” the brand (and the band) both garnered lots of social media love… all while getting their message across. Not to mention that Target is now running pre-roll in front of the clip on YouTube directing people to buy the band’s new album at — where else? — Target. From the Golden Globes to the Super Bowl to the Grammys to the Oscars (with Saturday Night Live’s 40th Anniversary special thrown in just to snark things up) this year has seen an increased use of platforms-that-aren’t-Twitter with positive results. 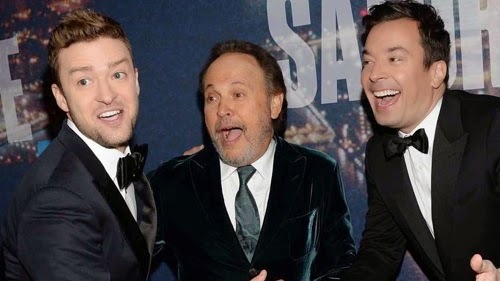 Justin Timberlake, Billy Crystal and Jimmy Fallon all appeared on SNL’s 40th Anniversary special. Few people over 21 had even heard of Snapchat last year, but then BOOM this year it was all over the big events, with a sizable influx of dollars and creative energy as everyone was trying to reach its young millennial audience. Last year too, Instagram and Facebook were barely calls to action and had no notable “real-time” plays that people could see. This year, both platforms had major calls to action and Instagram literally won the red carpet at a few of the events — the Golden Globes in particular, but Vanity Fair’s celebrity Instagram portraits by photographer Mark Seliger also made quite a splash. 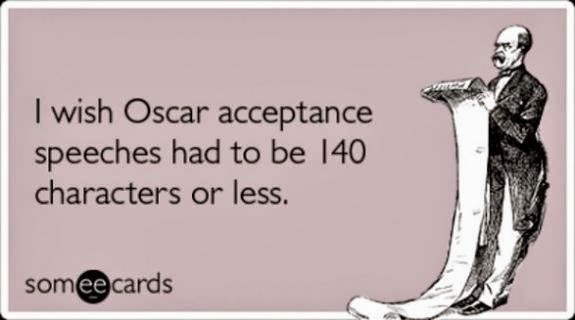 Oscar goes a little more classic, a little less glitzy with its Instagram celebrity portraits. ‘The Imitation Game’‘s Benedict Cumberbatch and ‘Cake’‘s Jennifer Aniston gave away a Golden Globe and then posed for Instagram pictures backstage. The takeaway is that Awards Season gives us a unique opportunity to test out those platforms, each of which offers a unique way to reach a segment of the audience that’s tuned out of traditional interruptive advertising and is looking for entertainment, a bar that rises higher every year as audiences continue to look for bigger and better circuses. More than just a celebration however, Awards Season 2015 has been an eight-week marathon of creative growth as well as a proving ground for the unified screen world that’s showing us why TV+Social+Digital will be the force that drives this industry into a “CreatedWith” revolution.